A rousing second-half performance produced a goal to give the Blue Toon hope of repairing the damage caused in the first leg of the final, but two red cards left the nine men with too much to do against a Stenhousemuir team which teetered on the brink in the midst of wave upon wave of Peterhead pressure. The odds were against Jim McInally’s side after the 2-0 defeat at Ochilview in the first leg. It was a sore one for the Blue Toon in more ways than one with the manager also losing the services of Jason Brown due to injury. The defender joined Mason Robertson in missing out while Rory McAllister, who missed a penalty in the first leg before limping off with a hamstring strain, was only fit enough to make the bench. It meant a defensive reshuffle for the home side with striker Russell McLean partnering captain David McCracken, who has been playing despite a calf injury, in a makeshift central defensive partnership. Winger Willie Gibson was also pushed forward into an attacking role alongside Allan Smith and Jordon Brown. Peterhead had to go for broke and Stenny set up to hit on the counter. The visitors’ approach almost paid an instant dividend in the third minute when Martin Scott sent Mark McGuigan clear on goal, but he fired over the crossbar when one on one with Greg Fleming in the home goal. The Blue Toon struggled to get going and Stenny should have taken advantage with another clear chance, but Eddie Ferns also fired well over. Peterhead were riding their luck and had another escape when McLean appeared to bundle Scott over in the box but referee Greg Aitken denied the appeals for a penalty. It was one-way traffic towards the home goal and it took until the 19th minute for the home side to threaten, with Jack Leitch firing over after working space for himself on the edge of the box. There was a disjointed feel to Peterhead’s play which was understandable given the reshuffle, but Scott Brown went close with a rising drive from a Smith lay-off. For all their efforts, however, chances were at a premium for the home side as Stenny safely made it to half time with their two-goal first-leg lead intact. Peterhead found their rhythm at the start of the second half and should have scored but Jamie Stevenson fired over from six yards after Jordon Brown headed a cross into his path. The full-back was on target with his next attempt, a half volley from the edge of the box, but Chris Smith did well to hold his powerful effort. The pressure was building and Stenny’s resistance broke as Peterhead got back into the tie. Smith made a super save to tip Leitch’s 30-yard strike over the crossbar, but from the resulting corner McLean rose highest to power a header into the top corner. The Blue Toon surged forward but their enthusiasm cost them dearly and captain McCracken, who had been booked in the first half, was cautioned for a second time for deliberate handball. Despite being a man down Peterhead kept the pressure on and Scott Brown saw a powerful drive saved by Smith as the Blue Toon pushed the visitors back into their own half. However, when Leitch earned his second yellow in injury time for a trip on a Stenhousemuir player off the ball as the visitors tried to catch the home team on the counter, the home side’s fading hopes were all but extinguished. 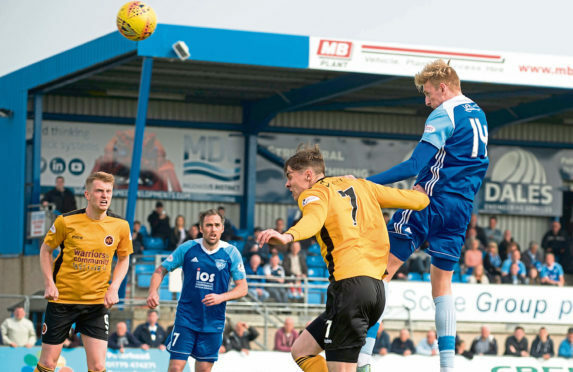 PETERHEAD – Fleming 6, Leitch 6, McIlduff 5 (Johnston 62), McLean 7, McCracken 6, Ferry 7, Stevenson 6, S. Brown 6, J Brown 5 (Norris 69), Smith 7 (Belmokhtar 80), Gibson 6. Subs not used: Hobday, Adams, McAllister. STENHOUSEMUIR – Smith 7, Meechan 6, M. Dunlop 6 (Marsh 73), R. Dunlop 7, Donaldson 6, Ferry 6, McGuigan 6, Paton 6, Cook 6, Scott 7, Ferns 6 (Murray 81). Subs not used: Halleran, Dallas, Longworth, Paterson, McMinn. Man of the match: Allan Smith.